Adapted from The Kitchen Diaries, pp. 345-47 and David Chang’s Momofuku, p. 49. If you knew that I had recently bought two Asian cookbooks at full price, you might expect this post to be about something I had cooked from one of them instead of a good ol’ rock-solid stand-by from Nigel Slater’s cookbook. I will indeed make a couple of recipes from Momofuku and Beyond the Great Wall. For the moment, I had to do something with the organic duck I had in the freezer and the new books had nothing that would help. Although Nigel’s recipe appears in the December chapter, the weather at the moment is cool enough to justify making this out of its proper season. I learned two key point from the meal I prepared. David Chang’s method of roasting a slab of pork belly at 450 degrees for almost an hour and then reducing the temperature to 250 for another hour or hour and a half works better than any other pork belly recipe I’ve tried. The onus is on you to make sure it doesn’t char too much in the first hour. You can never degrease a duck dish too much because there’s always more fat than you think. A description of how I plated the dish will give you a sense of its virtues. In a shallow pasta bowl, I placed a little mound of blanched kale/swiss chard greens and drizzled over it just a tiny bit of sesame oil. Beside the greens, I put a 1.5-inch by 1.5-inch square of roasted pork belly. A half-cup scoop of sticky rice next to the greens and pork. On top of the rice I placed a portion of duck — a half breast, a leg and thigh — over which I ladled some braising liquid. (I’ll reserve the salads for a subsequent post.) This was enough: a wonderful plate of food. The following recipe will serve four. Shadowcook: Whole Spice in Petaluma, California makes two kinds. Chinese Five-Spice contains cinnamon, fennel, ginger, star anise, and cloves. Chinese Five-Spice North Style has star anise, cloves, cinnamon, fennel, and Szechuan pepper. I used the North Style this time. Shadowcook: I made the duck the day before my little dinner party. Set the oven at 350. On the stovetop, warm the oil in a heavy, oven-proof casserole with a lid, then lightly brown the duck pieces in it. Peel and roughly chop the onions. Lift the browned duck out on to a plate. Add the onions to the pan, turn the heat down a little and let them cook, with only the occasional stir, until they are soft and sweet. Peel the garlic and slice each clove thinly, then stir it into the onion as it cooks. Cut the ginger into matchsticks, stir them in, then cut the spring onions into short lengths and add them to the pot. Leave everything to soften for a few minutes, then stir in the sugar, 1 scant teaspoon Chinese Five-Spice powder, chicken stock, and rice wine. Season with black pepper and salt and bring to the boil. Let the mixture boil for a good minute, then return the meat to the pot, together with any juices that may have escaped. Cover with a lid and transfer to the oven, setting the timer for an hour and fifteen minutes. Check the duck for tenderness. It should be soft but far from fall off the bone. Season the stew with a little salt. Scoop off as much of the liquid fat from the top as you can — there will be lots — then either lift the pieces of duck on to shallow bowls of rice and spoon over the juices, or let everything cool, then refrigerate overnight. If you take the latter option, the next day scrape off the white fat that has settled on top, reheat the stew and serve with rice. Shadowcook: I separated the duck pieces from the braising liquid. After both duck and liquid cooled completely, I stored them in plastic containers and put them in the fridge. Next day, about 2 hours before I served the meal, I roasted the pork belly according to David Chang’s simple directions. Several hours before dinner, combine the teaspoon of Chinese Five-Spice powder with the brown sugar and salt. Score the fat or rind surface of the pork belly. Rub the mixture on the pork, making sure it reaches the crevices of the surface scoring. Put the pork belly a container and marinate for a few hours at room temperature (or overnight in the refrigerator). Two hours before dinner, preheat the oven to 450. David Chang recommends putting the pork belly in a snug roasting pan. Stick the pan in the oven and roast the pork for 40 minutes. From that point on, keep an eye on it. The surface of the meat should be caramelized but should not be charred black. Let it roast at this temperature as long as possible. Then reduce the heat to 250. Roast for another hour or hour and a half, depending on how big a piece of pork belly you have. While the pork is roasting, about 45 minutes before eating, I scraped off the thick layer of fat from the cold braising liquid and saved it in another container. It will make a good base for sauteing. Then I put the degreased liquid in a braising pan, brought it to a simmer over medium heat, and let it reduce by almost half. 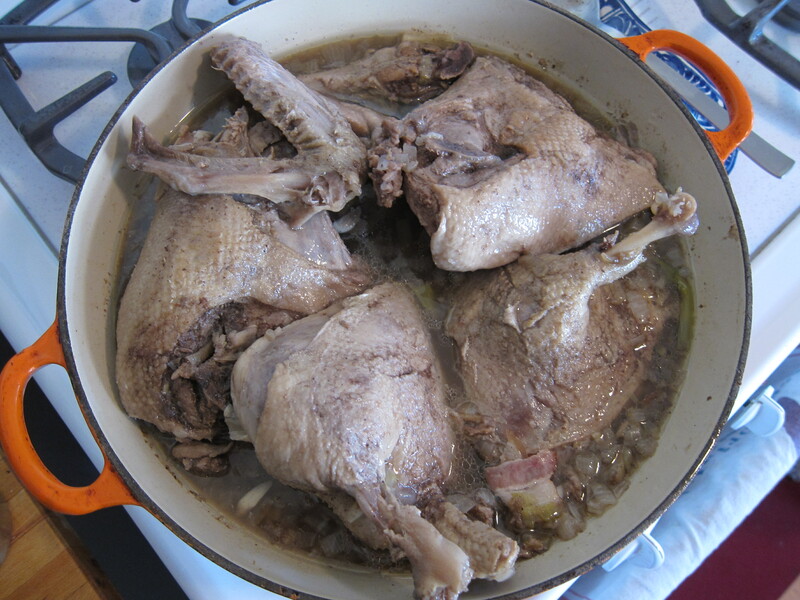 I added the duck pieces, reduced the heat, and warmed the duck pieces. Transfer the duck pieces to a platter. Before you serve, I’ll bet you any amount of money you’ll see another thick film of duck fat on the surface of the braising. I used a metal spoon to skim the fat off and added it to the copious amount of fat I removed the day before and stored in the fridge. Assemble the plates as I describe at the beginning of this post. Slice or cut into a squares the pork belly with a very sharp knife (so that it doesn’t fall apart). My guests relished the unctuous combination of pork and duck — but they would not have if I hadn’t take care to remove as much fat as possible.